Disney was probably never worried that spending more than $4 billion to buy Lucasfilm back in 2012 wouldn't pay off, but now they can rest easy knowing it was a great investment. Star Wars: Rogue One, the first standalone Star Wars anthology movie, has officially crossed the $1 billion mark at the worldwide box office. No matter how you look at it, that makes the movie a big success and should give the Mouse House a lot of confidence that Star Wars can be a massive cash cow for them for many years to come. According to Box Office Mojo, Rogue One: A Star Wars Story has grossed a grand total of $1.011 billion, with this weekend's estimated take factored in. Even when factoring in the reported $200 million production budget and the surely large promotional budget, that makes Rogue One a very profitable movie for Disney and Lucasfilm. Not only that, but save for a few scenes with Darth Vader, the movie largely focused on new and unfamiliar characters within the Star Wars universe and didn't have anything to do with the main Skywalker saga. So, the fact that a Star Wars movie of that nature was able to gross more than $1 billion at the box office is a very big deal. 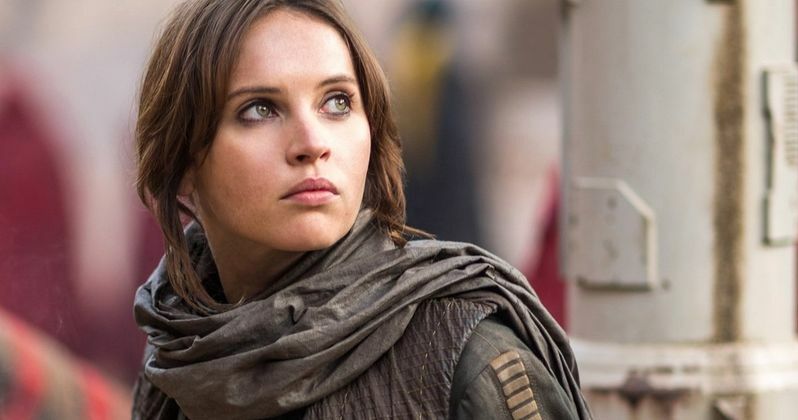 With the money Rogue One: A Star Wars Story was able to add to its total this week, it is now the fourth highest-grossing movie released in 2016 worldwide. It should be able to pass Zootopia's $1.023 billion gross in the next week or so, which would move it into the number three spot. Finding Dory is currently sitting in the number two spot with $1.027 billion and it now seems inevitable that Rogue One will overtake the Pixar sequel fairly soon. That would only leave Captain America: Civil War ahead of the latest Star Wars movie. The third Captain America movie from Marvel Studios grossed a grand total of $1.153 billion, so that will be a little more difficult for Rogue One: A Star Wars Story to manage, but it is very possible. Rogue One: A Star Wars Story is the first anthology movie from Disney and Lucasfilm, of which they are planning many more. That made it something of a risk, inasmuch as making a Star Wars movie can be a risk, ahead of its release. That risk proved to be worthwhile, since the movie has now grossed more than $1 billion and that should give Lucasfilm confidence to try some different things as they move ahead with these anthology movies in the future. That can only be good news for Star Wars fans moving forward. Next up will be the young Han Solo movie, which is due out in 2018 and is currently gearing up for production. There was zero expectation that Rogue One would do what Star Wars: The Force Awakens box office numbers did, since that was the first live-action Star Wars movie to be released since Star Wars: Revenge of the Sith, and there was a crazy amount of hype leading up to it. Star Wars: The Force Awakens wound up bringing in more than $2 billion at the worldwide box office, making it the third highest-grossing movie ever and the highest-grossing movie that wasn't directed by James Cameron, since Titanic and Avatar are sitting the number two and number one spots respectively. Next up for Star Wars fans is going to be Star Wars: Episode VIII, which we should be learning some details about very shortly and is due out in theaters on December 15. If Rogue One: A Star Wars Story is any sort of indicator, Disney should be getting ready for another big hit at the end of 2017.